Astrology is in many ways a key to understanding the real design or structure of our universe. In ancient times, for thousands of years, astrology and astronomy were interwoven as part of a spiritual science, and had personal as well as mundane significance. Only in the last century or so have all our knowledge disciplines become so compatmentalized or divided, and seemingly unrelated, reflecting the divide and conquer mentality or philosophy of our ruling elite. While our knowledge of the world and universe has undergone many changes in the last century or so, astrology is one of the few disciplines that has basically stayed the same for at least two thousand years. The zodiacal ecliptic, the Ascendant and Midheaven, the houses, the seven visible planets, the seven aspects, and all of their meanings have remained unchanged. What has changed is the addition of the modern outermost planets, Uranus, Neptune, Pluto, and other smaller bodies, as well as our understanding of the astrological houses. While on the positive side, modern astronomy has given us more bodies to work with, on the negative side, it has deviously inverted our view of the cosmos. It has taught that the Sun, rather than the Earth, is our cosmic center, and that the Earth is a planet or globe revolving around it, which conradicts all ancient sources. It also errs grossly as to the true sizes and distances of the heavenly bodies. While there are sound scientific or observational ways to prove a flat disc stationary Earth plane, astrology adds its own unique contribution to the matter. In my many years as a practicing astrologer, I have always wondered why the Ascendant or Rising Sign is observed as the most EXTERNAL feature of an individual's chart, acting as a kind of filter for all of the other components which appear to make up the INNER person. The exceptions to this may be the Midheaven or Earth dome which also plays a highly visible or external role, and the Moon, which is somewhere between the external and internal levels, but mostly internal. The Ascendant and Midheaven are our OUTERMOST coverings in the chart to which all the other planets or bodies take a back or INSIDE seat, at least as seen by others. This internal disposition of the planets is a direct proof or indication that, cosmically or scientifically, they are INSIDE the Earth/Heaven structure, and not outside as the astronomers tell us. This also means the heavenly bodies are much much smaller and closer than we have been led to believe. So the cosmos we see up in the sky is all within the Earth structure, and everything that is around us is also within us. As above so below, and as outside so within. So just as the Sun, Moon, planets and stars are within the Earth/Heaven structure, so the astrological planets and bodies are within our Asc/MC body structure. 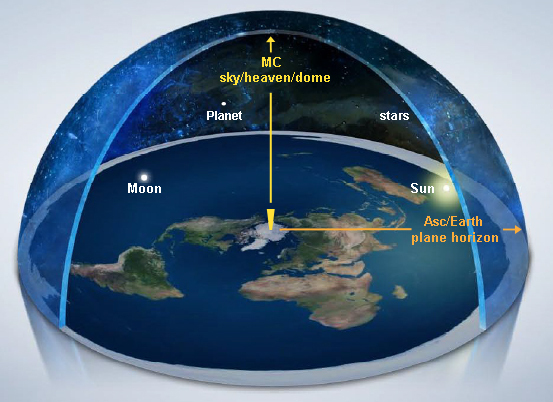 If the globe model was true, with all of the planets outside of it, then the Asc and MC factors would become internalized and less obvious than the planets, which is not the case. More specifically, your Sun sign would be more obvious or prominent than your Asc or Mc, which as every serious astrologer knows is false. So astrology and the dominance of the external angles over the internal Sun, Moon, and planets in a birth chart, are another nail in the coffin for a heliocentric globe Earth.